We had a wonderful time in Atlanta this past weekend teaching on how to hear from heaven all day and all night. We are grateful for the many breakthroughs and supernatural work Holy Spirit did in people’s lives and hearts as they began hearing His voice for themselves and translating the language He is speaking to them at night. Yay God! During our workshop we discussed the creative, meditative Alpha brain wave state – the state we are in when we dream. Because of the many benefits of being in Alpha, the question was raised during our Q&A: How can I get into the Alpha brain wave state more often, besides just getting more sleep? We discussed how many things we do naturally in our worship time move us into this prayerful state: for example, gently swaying back and forth, lifting our head upward, and closing our eyes. Praying in tongues is also an excellent way to move us into Alpha, connecting us with our spirits and Holy Spirit who is one with our spirits (1 Cor. 6:17). Another effective tool that gets us out of our heads (analytical Beta brain waves) and into our hearts (reflective Alpha brain waves) is using EFT. Emotional Freedom Techniques (EFT or “tapping”) has been scientifically proven to quickly move us into this more peaceful, productive space, neutralizing the stress response in our systems and empowering us to choose more positive emotional responses. While we can’t control our circumstances, we can control our reactions to them, and tapping helps us react well. 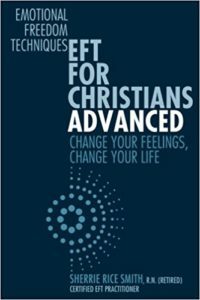 My friend Sherrie Rice Smith has just released a new book EFT for Christians Advanced: Change Your Feelings, Change Your Life. I love that title (!) and if you are familiar with her books I encourage you to get this one too. Sherrie recommends you work through her books in order, so if you haven’t already read the one I co-wrote with her you can get your copy here. If you learn better by listening and watching, MP3s and digital videos of the Biblically-based EFT workshop I did with Dr. Jim Richards at his Heart Physics conference last fall are also available. While EFT has been used successfully by corporate CEOs and Olympians alike to reduce stress and maintain peak performance, there are more than just mental health benefits to be gained. At our Atlanta dreams event, another attendee shared her amazing testimony of how tapping healed her legs. Michelle had had reconstructive surgery on both of her knees and was in excruciating pain, barely able to shuffle around. After just one tapping session, the pain was 90% gone. She laughed showing us how she was able to literally jump and skip her way out of the EFT practitioner’s office. Hallelujah! I have written previously about the incredible work being done using tapping with orphan genocide survivors in Rwanda and shared a short video highlighting the amazing results. Now there is a full feature-length documentary describing their inspiring journey of healing available to watch free here. It is powerful! What touched me the most was to see how once these young people were transformed, they immediately began sharing the blessing of EFT with others in their own country, as well as the US. A boy who lost his little brother in the Sandy Hook school shooting and hadn’t been back to school in a month did a tapping session via Skype with some of these genocide survivors who identified with his pain and wanted to help. His turnaround was significant and immediate, and he returned to school the very next day. Such a beautiful example of comforting others with the comfort we ourselves have received (2 Cor. 1:4)! Scripture says that “God has appointed… miracles, then gifts of healings” (1 Cor. 12:28). EFT is one of those gifts. Why not give it a try? Who doesn’t need a little less stress and pain and a little more creativity and peace? Science calls it Alpha brain waves, and the Apostle John called it being “in the spirit.” He often recorded being in this state when he received his heavenly revelations. For example, “I was in the spirit and I heard…” (Rev. 1:10). “I was in the spirit and I saw…” (Rev. 4:2). When we are in Alpha, the veil between the natural world and supernatural world is very thin and it is easier for us to look at what is unseen and live to that spirit realm dimension (2 Cor. 4:18). We can simply and effortlessly be in the spirit by connecting to Holy Spirit’s river of life flowing within (Jn. 7:37-39). The kingdom of God is peace and joy in Him, and Jesus said the kingdom is inside us (Lk. 17:21). So what are we waiting for? Let’s tap into God’s presence and release more of His grace, goodness and glory today! In case you haven’t heard, our ministry is now on Facebook and we invite you to follow us at FB.com/GloryWavesMinistries. Thanks for liking our page and sharing it with others. We love staying connected with you!